In a recent article in the Huffington Post, popular travel writer Richard Bangs listed his picks for Best Hotel in the World, Fall 2017. Our Inn was included on his list, which has been a tremendous honor for our Inn, and one we think reflects the amount of effort that occurs behind the scenes to make your stay with us nothing but the best. 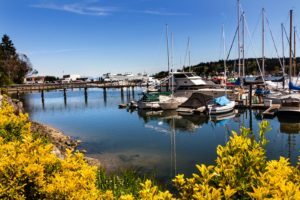 The article does a wonderful job describing the architecture and amenities offered at the Eagle Harbor Inn, but we think there’s another wonderful reason to stay at the Eagle Harbor Petit Hotel on Bainbridge Island. We are the only walkable hotel that allows you to fully explore Winslow, the charming heart of Bainbridge Island! From here, you can find most things you want to see and on Bainbridge by foot, and for the rest you can rent bikes or utilize public transportation. Come see why Bainbridge Island is such a popular getaway destination. Book a room at our Bed and Breakfast today. The Waterfront Trail, the perfect way to enjoy Bainbridge Island’s picturesque Eagle Harbor. Getting to Bainbridge by foot is easy, via the Washington State Ferry System. From there, why not continue your journey on foot It’s the best way to experience Bainbridge. There is only one place on Bainbridge that will give you the walkability you desire, and that is The Eagle Harbor Inn Petit Hotel. Book your room today.